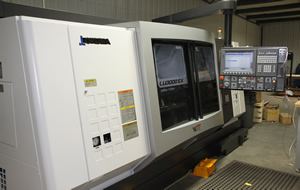 With more than ten years industry experience and a handful of employees, Longleaf has achieved major goals as a successful machine shop producing top quality parts with on-time deliveries. 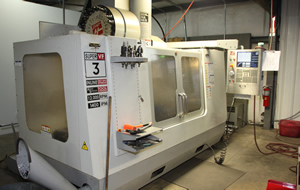 Located in Brewton, Longleaf began their business by machining compound bow risers, cams, wheels, mods, limb pockets through provides full service, close-tolerance contract machining with the use of computer numerically controlled and manual machines. Their focus on quality has permitted them to meet their customers’ needs in market segments such as archery, firearms, mining, off-road, oil and aviation industries. 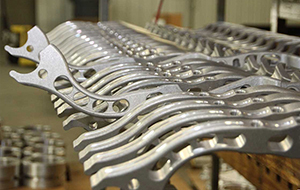 Longleaf produces high quality original equipment manufacturer parts (OEM) designed to perform and fit factory specifications that increase the operational life of equipment. These products provide high quality, cost cutting solutions for local industries. Seeing opportunity in the industry, Longleaf diversified their business model in the development of specialized parts for their customers. 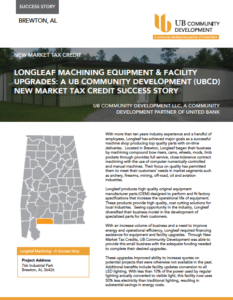 With an increase volume of business and a need to improve energy and operational efficiency, Longleaf required financing assistance for equipment and facility upgrades. Through New Market Tax Credits, UB Community Development was able to provide this small business with the adequate funding needed to complete their desired upgrades. These upgrades improved ability to increase quotes on potential projects that were otherwise not available in the past. Additional benefits include facility updates conversion to all LED lighting. With less than 10% of the power used by regular lighting actually converted to visible light, this facility now uses 50% less electricity than traditional lighting, resulting in substantial savings in energy costs. UB Community Development, a community development partner of United Bank is dedicated to meeting the needs of our community. 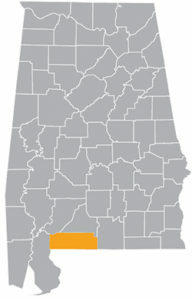 UB Community Development serves communities throughout Alabama and beyond by providing funding solutions designed to increase economic development, create jobs and promote better access to goods and services. UBCD is currentlyusing its NMTC allocation and Community Facilities Lending Program to fund businesses and finance projects related to education, healthcare, manufacturing, hospitality, non-profits, community centers and more.